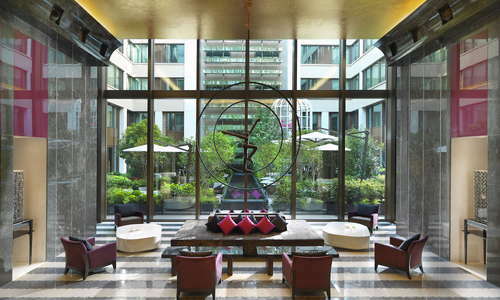 Of Paris's palace hotels—the highest designation—the Mandarin Oriental, designed by starchitect Jean-Michel Wilmotte, is among the most contemporary, with a soaring marble entryway and a sleek, luxe style that makes a marked contrast to the historic grande dames. 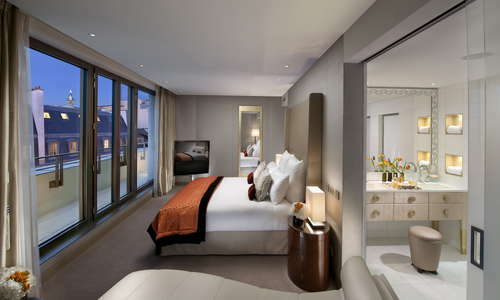 The hotel has cultivated a fiercely loyal clientele that relishes its more modern approach to luxury, not to mention its plum location in the heart of one of the city's most upscale shopping districts, and close to the Louvre, the Tuileries, and a multitude of other top attractions. 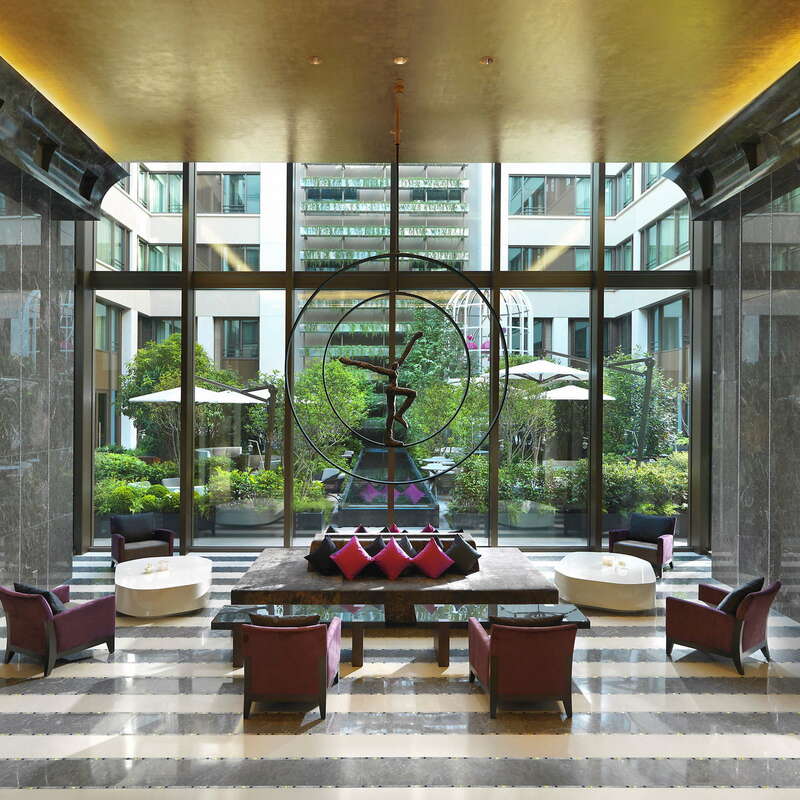 YOU SHOULD KNOW There is a certain coolness about this hotel, perhaps it's the marble lobby, the sleek decor, or perhaps the soaring volumes of its lobby and interior courtyard. 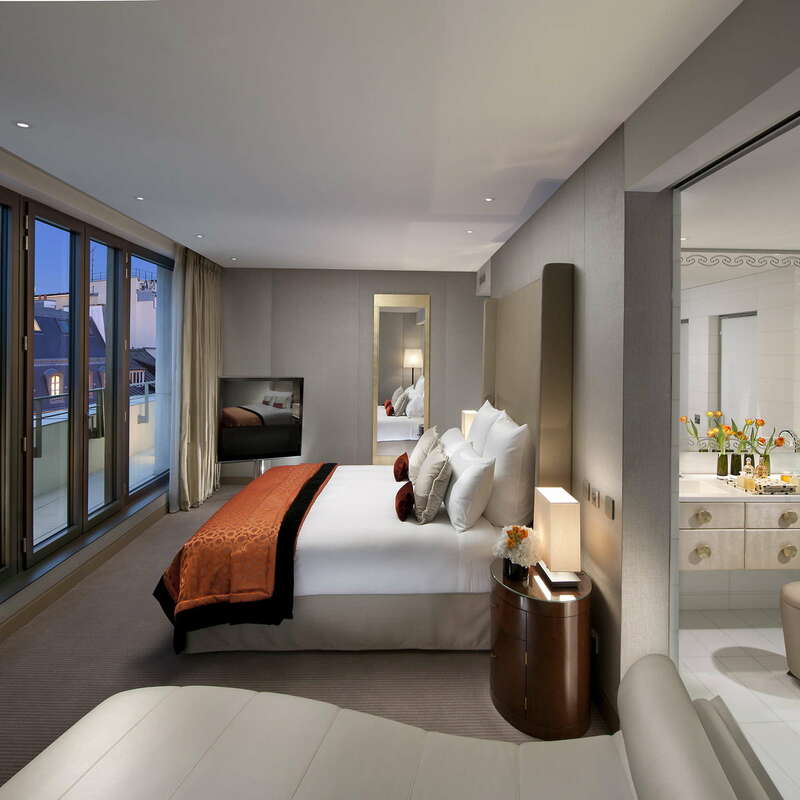 Those who crave a more traditional luxury might prefer Le Bristol or the Ritz, both nearby. Spacious art-deco-inspired rooms feature lustrous dark-wood furnishings and creamy walls, accented with deep mauve or taupe, with sleek furnishings, luxe bedding, and contemporary artworks. You'll pay more for a terrace room, but it's worth it, especially in warm weather. 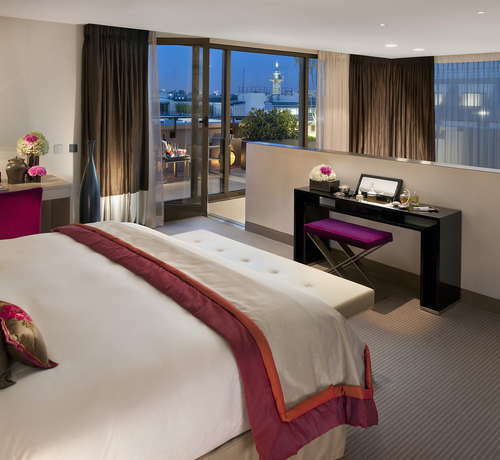 If you're not up to shelling out the extra cash, try to book one on a high floor for a chance at an Eiffel Tower view. 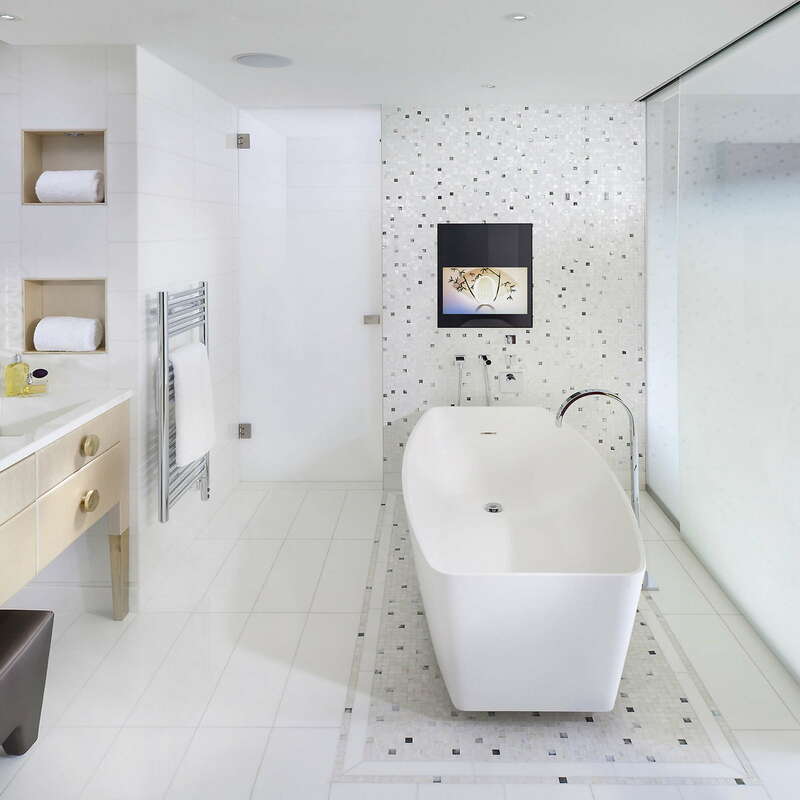 Large, white-marble baths are as spotless as the driven snow, with walk-in showers in lower category rooms and separate bath and shower in all the others. The soaring lobby is a bit cold, but offers some slightly more cozy seating arrangements among trees and plantings and pleasant outdoor seating in warmer weather. The long, narrow pool is perfect for morning laps but not conducive to splashing around. 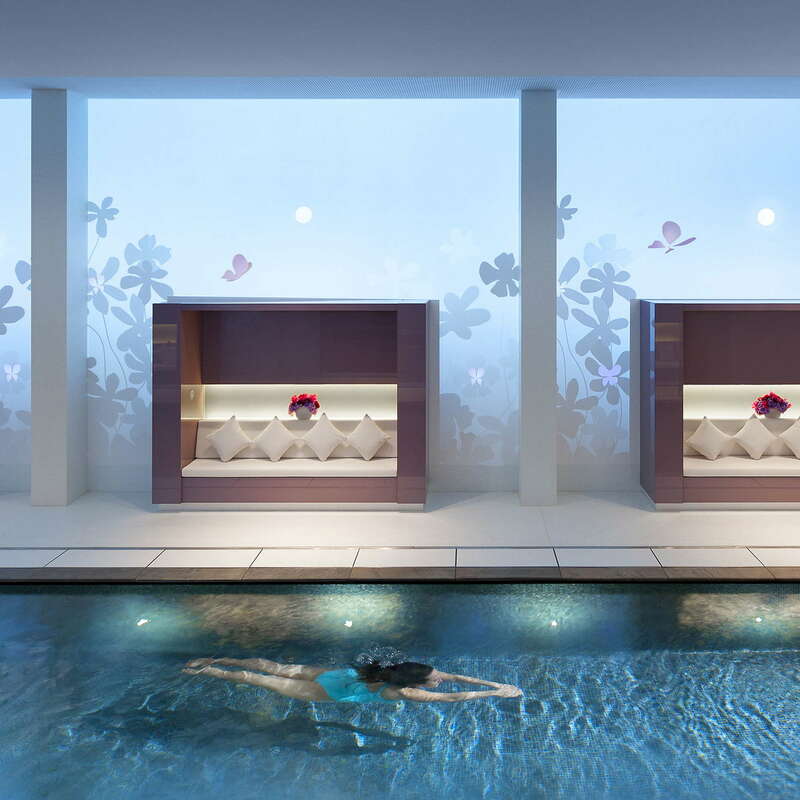 The beautiful Guerlain spa offers spacious treatment "suites" that come with full bathrooms and three couples suites equipped with double tables and a whirlpool. 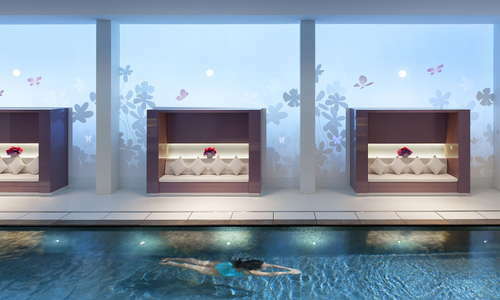 A huge range of luxurious treatments are available. The spa has no sauna but steam showers in the treatment rooms. YOU SHOULD KNOW Unless you've signed up for a spa package, be careful of extra charges for the steam room and jet bath. The spacious, low-ceilinged fitness room offers all the stationery equipment you could wish for, plus the possibility of a personal trainer. Michelin-star dining can be had in the dreamy white atmosphere of Thierry Marx's elegant Sur Mesure and the lesser-priced (but still pricey) Camélia. 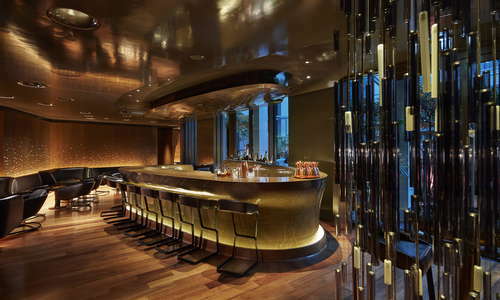 Marx is one of the few Paris chefs to embrace molecular gastronomy and a more healthful approach to luxury dining. Expect enough imagination and flair to make this dining investment a truly memorable affair. For more casual dining in the courtyard atrium, L'Honoré bistro is a stylish and healthy place for lunch, dinner, or a snack both indoors or out on the terrace. The deluxe breakfast buffet (or to order), also served in the courtyard, includes everything you can imagine. 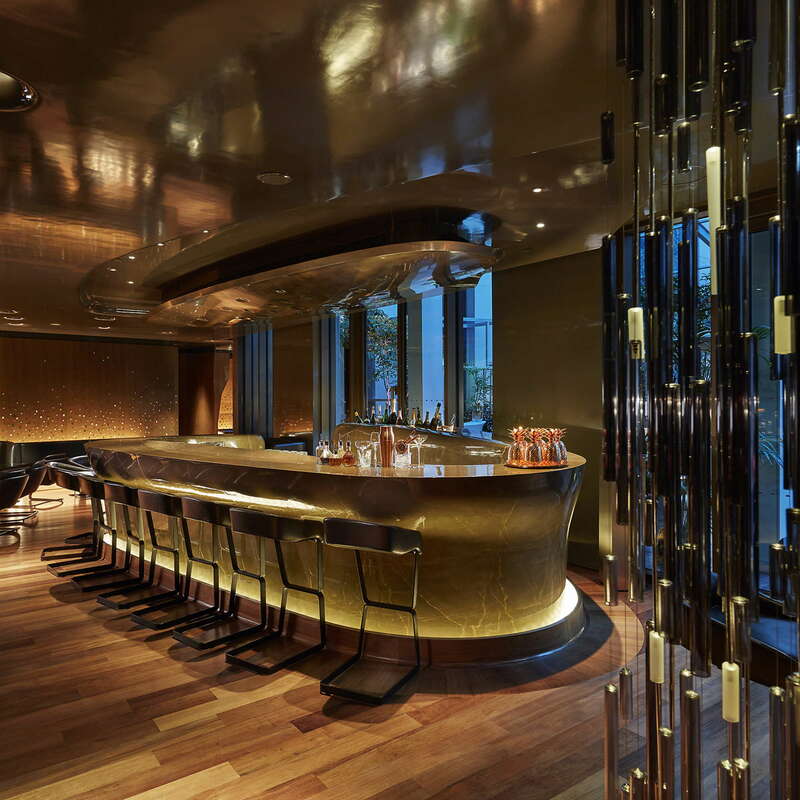 Atmospheric Bar 8, whose internally lit bar is hewn from a single block of stone, is a chic spot for a before-dinner drink, nightcap, or just to relax with friends over small plates and a bottle of wine. The signature cocktails are quite good and if you're staying here you probably won't mind the eye-popping tab. The hotel is a few minutes walk to the Concorde and Madeleine metro stations, which cover four metro lines, getting you pretty much anywhere in Paris. One of Paris's top Asian-inspired gastronomic havens, Yam'tcha (a 5-minute walk down the Rue Saint-Honoré), is helmed by chef Adeline Grattard, whose imaginative, market-fresh dishes, along with a lovely atmosphere, and small zen garden, inspire month-long waits. Try to snag a table, but if you can't grab some gourmet buns to go at her dumpling shop, Boutique Yam’Tcha, just down the street at 4, rue Sauval. 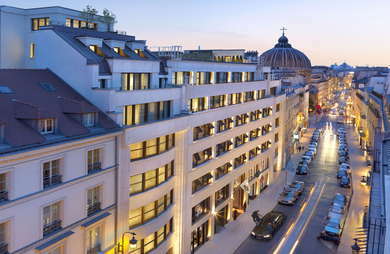 This is not the only Palace hotel in the hood, there's also the Ritz and Le Meurice a few minutes away, where two of the city's more classy cocktail bars reside. Le Meurice's atmospheric Bar 228 piano bar or the legendary Hemingway Bar at the Ritz—both helmed by a famous Parisian barman—may set you back a bit, but it doesn't get more glamorous than this. For something a bit less daunting, walk through the Palais Royal gardens to Willie's Wine Bar, an expat hangout with good food and a congenial atmosphere. Catnip for the contemporary-art and fashion crowds, who adore its sprawling outdoor garden terrace, two gourmet restaurants helmed by Michelin-starred chef Thierry Marx, chic late-night cocktail bar, and luxe spa. All this contemporary luxury might appeal to you too.